I've lived in rental units since first coming to Japan. 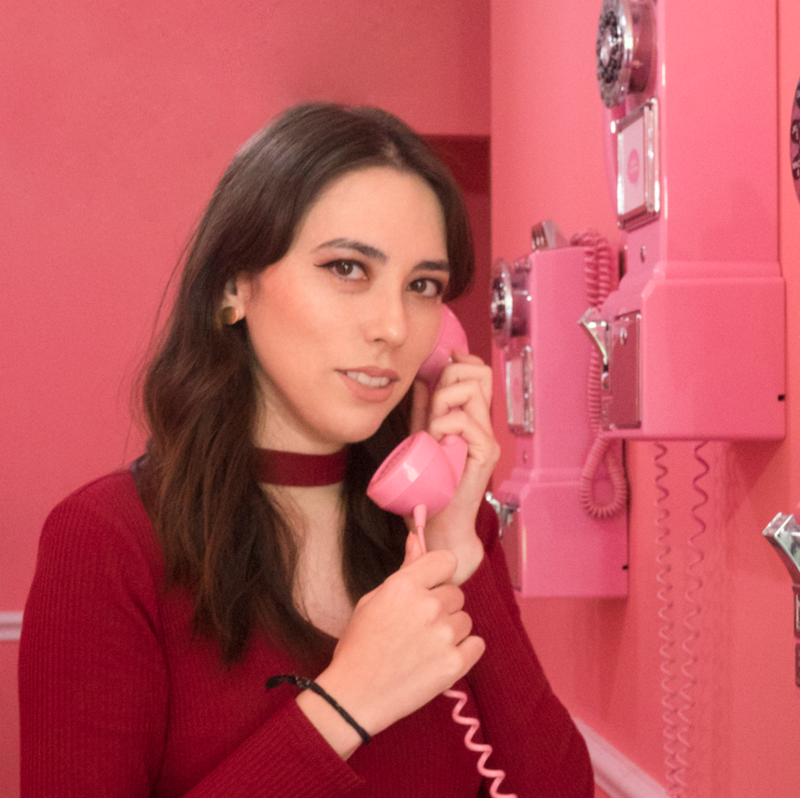 But, after a string of bad luck ranging from mold to grouchy neighbors to a flooded floor to having the water completely shut off (among so many other things), I decided that I didn't want to deal with it anymore. My solution to no longer dealing with rental companies, landlords, and key money was to move into a share house instead. If you don't know, a share house is a building that rents out individual rooms, with "shared" common areas like a kitchen, living and dining area, and bathroom. They're popular in cities and with younger people and expats because they have lower initial move in fees and often don't require long contracts. Plus, they're easy ways to meet new people, especially if you're new to an area, because of the sense of community that's inevitably formed. However, it's a give and take between residents as well. And, just as you can have bad neighbors in your neighborhood, you can have bad housemates in your share house. I've experienced a few of them, as living in a share house means you see a lot of transients and meet a lot of different people. For example, when I first moved in, there was a woman who was moving out. She just up and left one day, with no warning, leaving everything she didn't want to pay to get rid of behind and leaving the manager to pay for disposal of everything. We've had a woman who would invite in and bring strangers to our house practically every other day. There was someone who would always get violently drunk at the house parties and break something or pick fights. We even had a pair of tattooed gangster-types who used to smoke indoors and the manager was too intimidated to do anything about it. But, despite this unique cast of characters, I never disliked living in a share house. Until a middle-aged Japanese man (hereon referred to as MAJM) moved in. You could tell that he had a chip on his shoulder from the beginning, and he was very rude to myself and the two other expats who lived in the house. He spoke some English, though not well, and would never bother saying anything to us in Japanese. At first, us English-speakers thought nothing of it. Sure, he was a bit prickly but some people just aren't friendly... Though why those kinds of people would choose to live in a share house is beyond me. But, he'd get progressively more and more aggressive towards us. The atmosphere in the house got more oppressive as he created tension and he also practically lived in the kitchen-living communal area, so it was almost impossible not to see him on a daily basis. However, the culmination of the problems finally came to a head in the share house's LINE group chat. 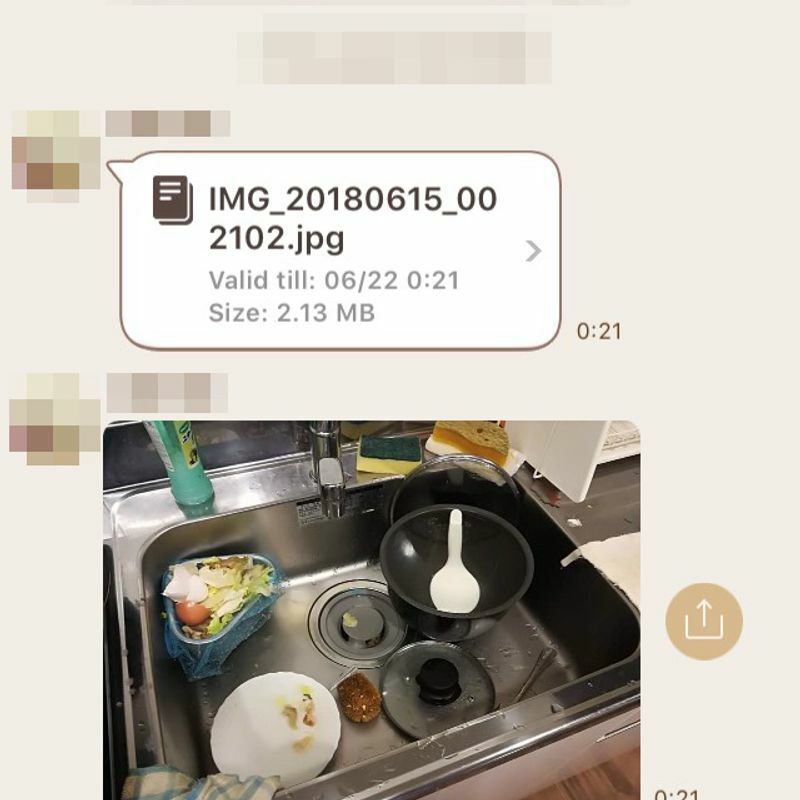 Apparently, during one of the rare instances when MAJM wasn't posing as a sentry at the kitchen, someone had cooked a meal and left their dishes behind without washing them. Now, part of living in a share house means respecting the common space, which includes cleaning up after yourself and doing your own dishes. But, people get busy and sometimes don't clean up right away. I guess he wasn't in the mood that evening and went off on the group chat. While I agree that people need to be responsible for their actions, calling someone out in this way wasn't the way to do it. Ahh, but that wasn't all. In addition to a dirty sink, someone had also left some trash and/or some other unidentifiable items on the counter. At this point, I figured MAJM was just on a rampage, as the scene he sent had been like that for a while and it was out of the way, on the side no one ever used. 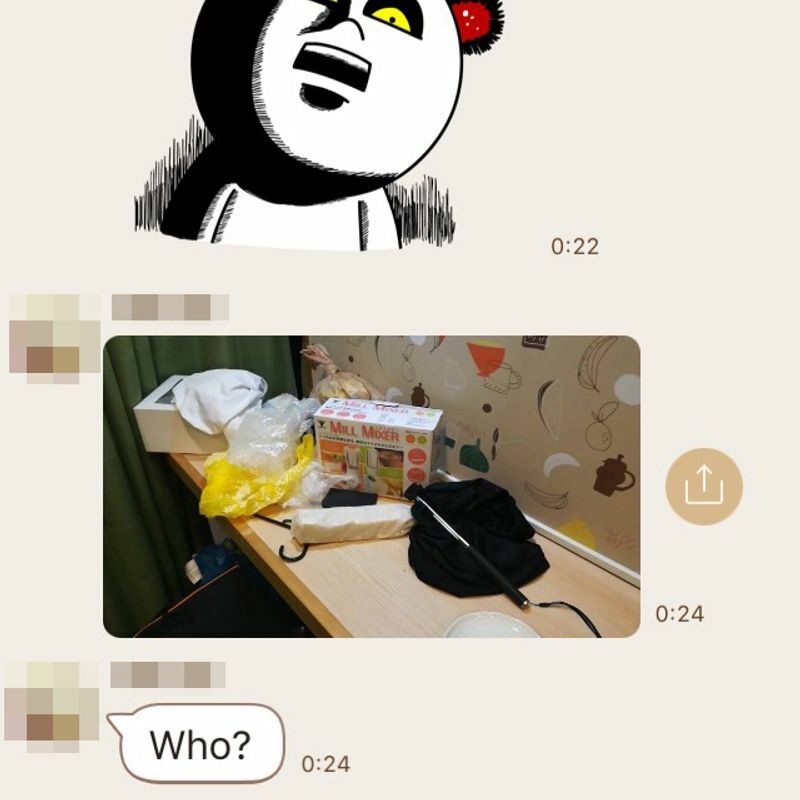 First was the fact that he only wrote his mini-rant in English, despite the chat being primarily in Japanese because most people who live in the house are Japanese speaking. This meant that he obviously thought it was one of the three non-Japanese who left the place a mess because Japanese people always clean up after themselves. The second was the use of "we." Whether MAJM meant it or not (but I'm sure he did), he was creating a clear dichotomy. "We" meant the Japanese people in the share house, and he was graciously speaking out against the "others", or non-Japanese. Please note that there were no issues with any of the other residents, and we often drank together and went out as friends. Lastly, I was upset that MAJM had the audacity to say that the mess is what was making people uncomfortable and not his previous power-hungry microaggressions against us expats. To say that making a mess was a reason to be evicted while completely ignoring his own oppressive presence as the root of the tensions was completely in character for him. 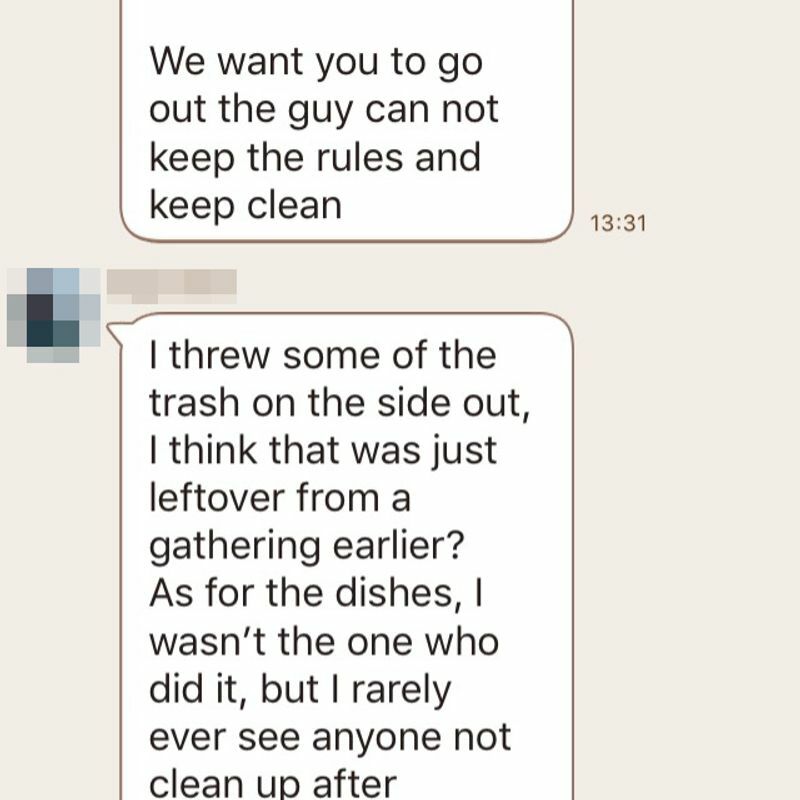 One of my fellow expats decided to try to keep the peace by explaining that he couldn't definitively say who made the mess, but it was all of our responsibility to take care of the house. I didn't say anything because I knew my temper would make it a bigger issue than it already was. After my friend commented, there was no response or further mention of it. I doubt that MAJM even read any of it. He doesn't speak English well so that wall of text was probably too insignificant to even bother with. But, the next morning, the dishes were washed and everything put away. None of us expats did it, but perhaps it was the culprit themselves who did it, or just another share house member who was tired of the infighting. We'll never know because no one has copped to it. Whatever the case, your dwelling should be somewhere that you can go to after a long day out and expect to rest and relax. It shouldn't be someplace where you feel pressure for every decision and move you make, or uncomfortable when someone else is present. I moved out a while ago to another share house that's better run, and couldn't be happier. For those of you wondering why we didn't complain to management... They were just as biased as MAJM was. I received this picture recently from someone who still lives there. 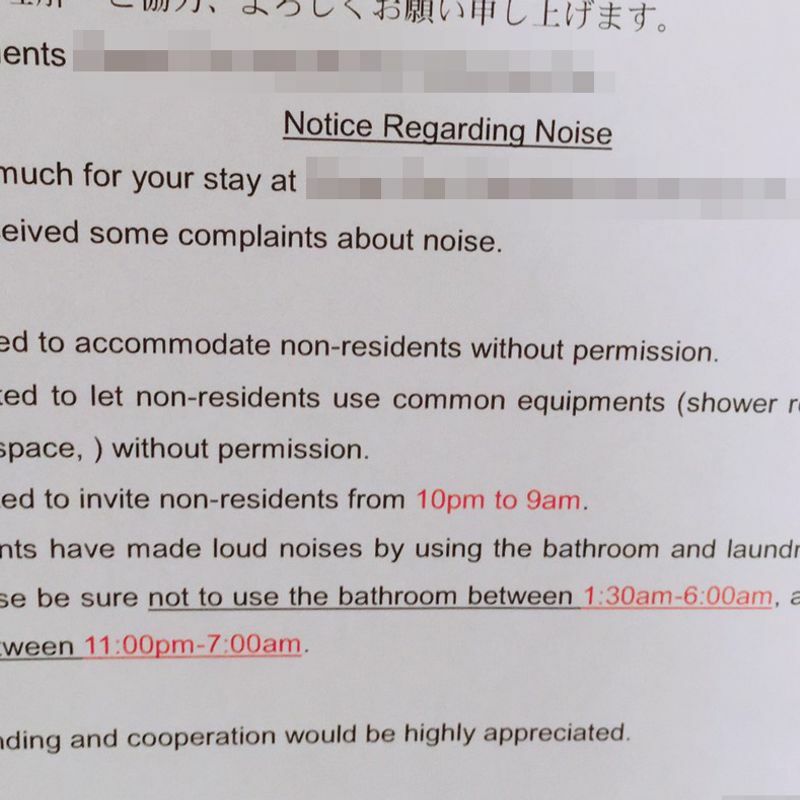 Apparently, this is their response to a complaint about noise. Sometimes, things aren't worth it and it's better to just move on. And I'm so glad that I did because this living experience was far worse than anything I've dealt with so far. Wow, that’s awful. Some people pick fights with non-Japanese because they’re bored and want attention. A neighbor blamed me for untidy garbage on our street, but it was the guy across the road. But because I stand out as a non-Japanese, I got blamed. The other neighbors, however, were kind and new who the culprit was. @TonetoEdo That, unfortunately, seems to be the usual case... At least your neighbors had your back! I hope your nasty neighbor backed off a bit after that.